I have been eagerly waiting for this novel, more than most. I thought Wolfhound Century was that good that I chose it as Book of the year for 2013. Truth and Fear — the second volume in the series, narrowly missed out from being book of the year 2014 (That accolade going to Dave Hutchinson's Europe in Autumn). 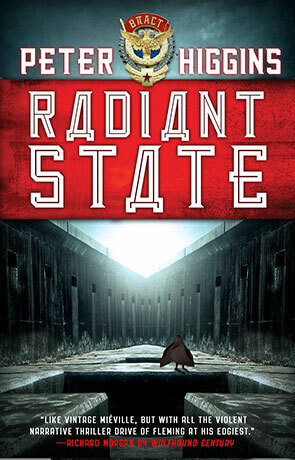 Radiant State is the concluding novel in this incredible series and boy are you in for a treat! I would advise any readers to consume the first two books in the series before starting here and while I always try to avoid spoilers speaking of what I thought of the book there is bound to be some things mentioned that happened previously. Evocative doesn't begin to describe the book, it has a lyrical intensity that borders on grandeur, a delight to your senses and a treat for your grey matter at the same time. The way the author manages to create this alternative vision of a Russia that is steeped in myth and the fantastic is simply breath-taking. Each book changes the landscape significantly. Six years have past since the events of Truth and Fear and while we may have peace, it's a forced and fragile peace which is clutched tightly in the hand of Joseph Kantor — reborn under the name of Osip Rizhin and leader of the new Vlast. His vision of the future extends way beyond the imaginations of the populace and includes an endgame that no-one could have seen coming. Again it's up to ex-investigator Vissarion Lom and Kantor's step-daughter Maroussia to try and prevent Kantor's twisted vision. The author delves deeply into this world of the Vlast and shows us how it has changed, fractured and how the myraid people of the region cope. The actual plot — stopping Rizhin / Kantor plays only a part in this exploration. The atmosphere is incredible, there is an almost tangiable feeling of the dirt and the grime that is thinly hidden behind the veneer of Kantor's government. Its dark and dangerous with an earthly magic that feels suitably alien and irreplicable. Radiant State concludes the series magnificently, it is an incredible novel — one of those that are impossible to pin down into a category or even genre. This is speculative fiction at it's finest. Written on 15th June 2015 by Ant.